With another week of January behind us, football across Europe is now in full swing. Teams have begun the second half of the season in earnest, and all of them need to hustle as they look to move up the tables and surge towards their goals. With an empty pre-season ahead of us, clubs and players will not be too worried about a tournament, and o we should see them going all out with full intensity. 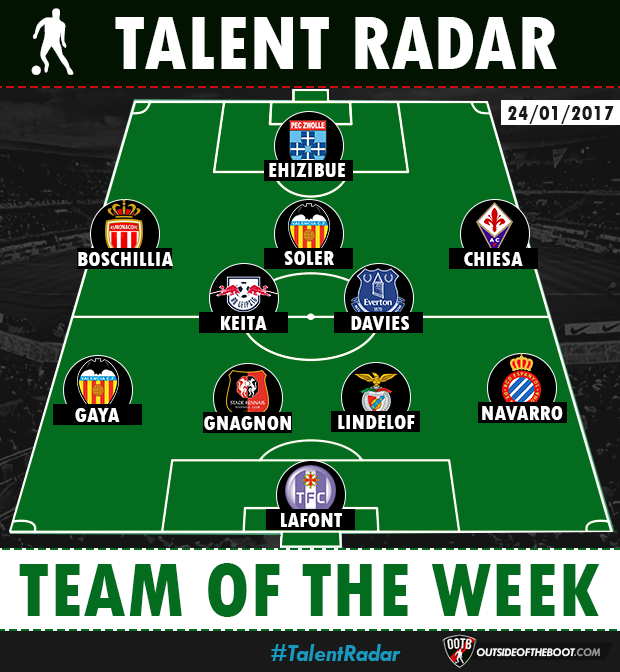 That said, let’s move to the team of the week! Defence: In goal is the Toulouse keeper Alban Lafont. Lafont has made it into the team in the past, and another spectacular performance has earned him another place in the line up. Although Toulouse lost the game 1-0, the margin could’ve been much worse had it not been for the keeper. He stopped a penalty and was generally a very effective barrier. At right back, we have Marc Navarro of Espanyol. The Catalan club enjoyed a fine 3-1 win over the weekend against Granada. The right back made a fine debut for his team, scoring a goal for them, making it a match he will remember for a long time. On the other wing, is Jose Gaya. The highly rated prospect has lost his way in the last few months, as his team Valencia have struggled to find direction and currently find themselves in a state of turmoil on and off the field. This weekend saw a welcome win for them away from home at El Madrigal. The 21 year old Gaya, was solid at the back for them, making 6 tackles and keeping a dangerous Villareal side away from his goal. A young center back that has been grabbing headlines across Europe is Victor Lindelof. The big Swede showed us all just why that is the case with an excellent showing. Playing out from the back, he completed 93% of his passes, and was generally a tough nut to crack defensively as well. He even managed to get 3 shots on target, an impressive achievement even in a dominant win. His partner in defence, Joris Gnagnon had a much tougher ride, with Rennes managing to pull out a 1-1 draw despite being a man down. The 20 year old center back made 4 interceptions to keep things steady at the back even as Guinamp pressed on in the second half to try and force a win. Midfield: The central midfield was a powerful combination, with strength, stamina, and guile all present in equal measure. Firstly, Everton’s Tom Davies continued his dream run in the first team with an assist this time, laying on for Seamus Coleman to grab a late winner against Crystal Palace. The youngster has shown incredible calm and poise in midfield, really bolstering the challenge that Everton are making. His partner is the irrepressible Naby Keita. He was pushed forward this weekend to compensate for the absence of the suspended Forsberg, and he did not disappoint. He picked up an assit for Werner’s goal with a fine free kick, and really, did everything aside from score himself. His pace and running were too hot to handle for the hapless Frankfurt defence, who were left looking really ragged by full time after being down to 10 men for most of the game. The third member of this powerful midfield trio is Carlos Soler. Featuring alongside his Valencia teammate, the midfielder makes it in on the back of a goal scored in the important win over Villareal to complement his all round performance. On the right wing, we have a first timer in Federico Chiesa. The Fiorentina teenager capped off a fine performance with a late goal, as his team romped to a 0-3 win away at Chievo. On the lef win, we surprisingly don’t have the constantly brilliant Thomas Lemar, but instead, his teammate, Boschilia. The Brazilian scored a quickfire brace as the trailblazing side of youngsters won another 3 points to keep themselves at the top of the table. Exciting times ahead of them, as they travel to the home of the champions, PSG this week. Forward: The lone forward this week is another fist timer, Kingsley Ehizibue. The young Dutchman was quite the menace for PEC Zwolle as they beat ADO Den Haag 2-1 away from home. He scored a goal, and was a handful, taking 4 shots on target for his side.